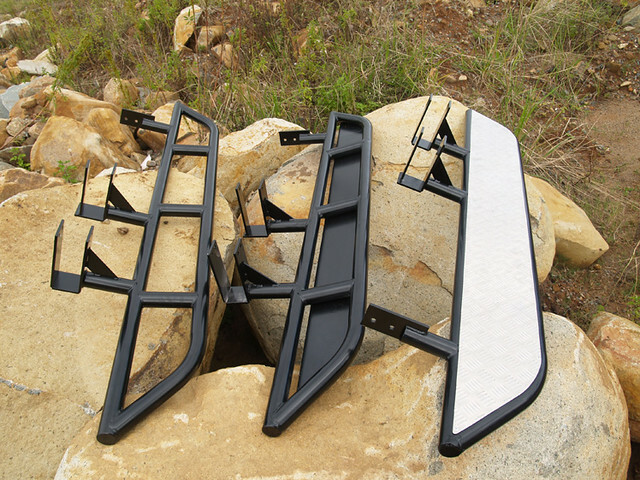 What's protecting your 4WD, and how do you melt it together? New bar work from rocksliders.com.au in Maroochydore, Queensland. I just saw this on their Facebook page and thought I'd share it with you. I have not seen a better product anywhere/any brand as yet. If you see a better and stronger product, by all means post it up, but nobody has been able to show me anything better as yet, not even the U.S. factory products, which are beginning to be largely dominated by air bag compatible designs. Hope your happy with them. 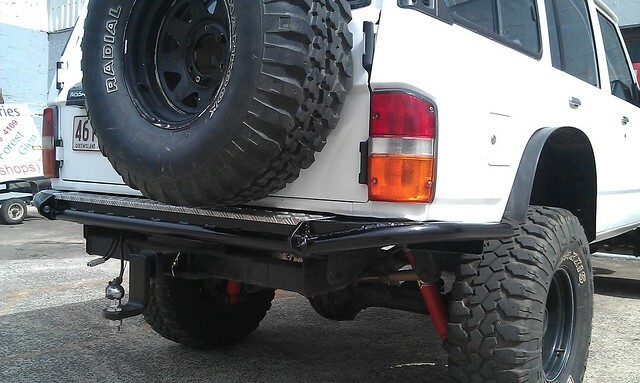 Re: Rock Sliders in Maroochydore! I have their sliders on my Patrol and they are awesome. Good people to deal with too. People have 2 ears and 1 mouth, they should be used in that ratio. Yes, one design flaw though is the center pillars on them are 90 deg vertical to the outer rail. 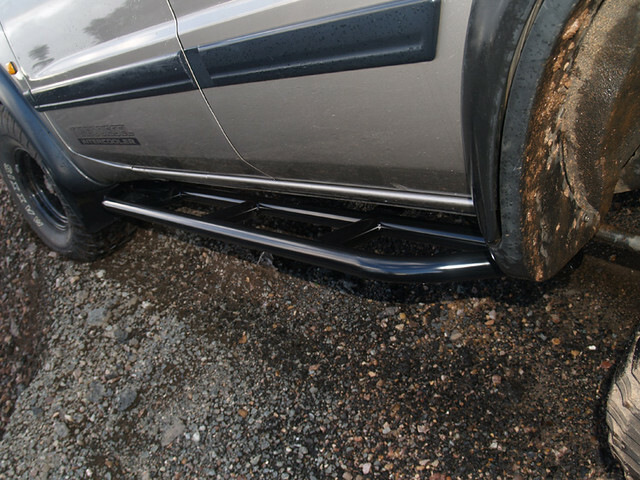 Without the skid pate underneath, rocks can hit quite hard on those bar pillars or can get hung up on a rock, or worse, an object like a log can be encouraged upwards rather than being deflected away from the vehicle. At lot of people are making their own sliders with these bars angled backward to help deflection as the vehicle is moving forward. Other than that, these are 3mm seamless pipe. Very strong. You obviously haven't looked very hard !! I could name a few custom shops of equal & better quality. brooksy wrote: You obviously haven't looked very hard !! I could name a few custom shops of equal & better quality. 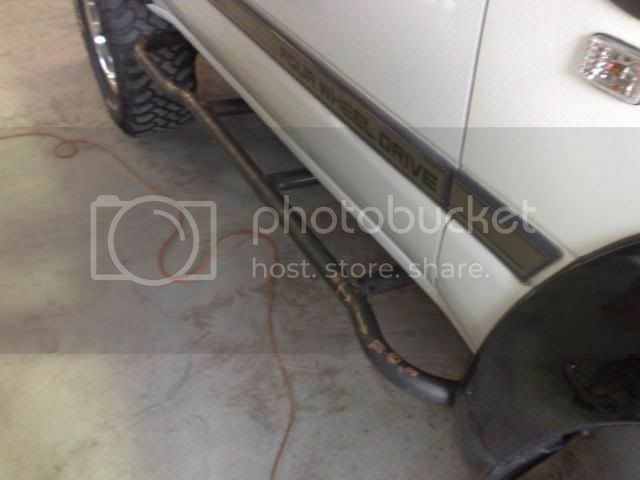 Sorry if this steps on your toes --> Custom 4x4 Fabrications from Greenbank You obviously don't consider freight and those looking for local fabricators hence why the location is named. I'd rather go on a day trip and collect them myself than pay a courier for a near 50kg load from way over the South Side of Brisbane. 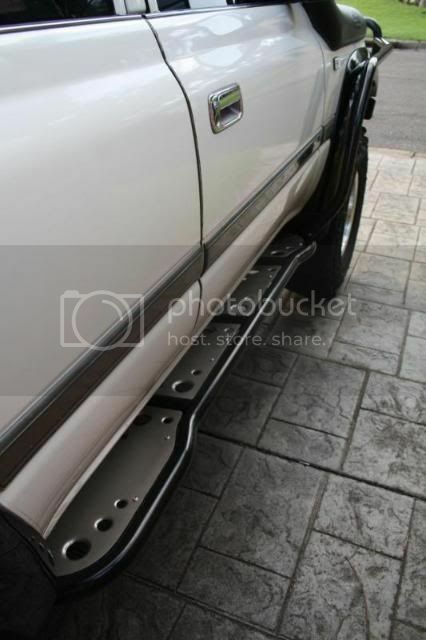 Your post is not helpful as it is, could you provide more information on fabricators of Rock Sliders on the far Northside of Brisbane please? Stating not looking hard does not help. Images of work done does and who does it will help more. No offence, but not a good post you made, especially for a moderator with an apparent agenda in this thread. It can be perceived as subliminal canvassing. No toes stepped on here !! A quick search on me & you would quickly realise I am far from the "canvassing type" which is why I didn't go blurbing about my work & clearly stated there is good Offroad fabricators that you had not considered. I have been around for quite sometime & have no need to big note & wouldn't as it achieves nothing. Your statement about nothing better here or in the USA is very short sighted & is basically what I was remarking about only. As far as freight I am also well known for going beyond the call of duty & have delivered myself (& fitted also) at no extra cost. But that is enough of me & as a Mod it is my responsibility to check for any possible vendor advertising which is what brought me here in the first place, nothing more. Okies then Brooksy. If you were looking for possible canvassing in the OP, I don't understand why you would pass comment like you did and it was confusing/unhelpful. Understand from my perspective it was concerning. Your right I don't know you and wasn't going to sift through over 3000 posts to see who you were. A lot is in your signature already. In my OP, I did ask anyone if they knew of a similar or better product and to share this in the thread. With that said, I invite you to post some pickies of your work and state approximate prices materials used. Your not canvassing if a poster requests it as being relevant to the thread The product in the OP as naked is $850pr during 2012 for reference. I spent a couple of hours doing google searches. Mainstream exported retail rock sliders in the U.S. were not only rubbish looking, but would cost a great deal to import making then unviable anyway due to weight. I recently bought some imported bash plates, 35kg in weight and was charged $110 freight from Victoria. From Maitland, I had a lodge style tent weighing 85kg for $350 in two separate bags - poles and tent. From Brisbane South Side, courier would cost roughly $70 - $80 to where I am with $50kg of steel. Otherwise, I rarely go to the South Side and wouldn't for Rock Sliders. So therefore, whilst my partner is visiting family in Bundaberg, I can pick them up and so could anyone on the Sunshine Coast or around Caboolture etc. Unless of course there was something worth while to go out of my way for. Anyone that reads this may feel the same way. It's only local competition anyway. I don't know if I stated it already, but I have spoken to this mob and they are happy to angle the vertical bars as mentioned before and have done so for other customers. Brooksy is not and cannot canvas- due to his inability to proceed with orders from the general public. Ok then an example if you insist. Not sure if this will work as my computer is down & I am using my phone. These cost $1,150 & they have brush stainless infills that are recessed & dimpled/flared holes which is a trend I started years ago. Basic sliders as in OP I charged $600. The thing also is that I only use the best materials which is DOM or Hrew seamless CAMS Spec materials. I am not taking anything away from the company as everybody has a different rate & if people are willing to pay well that is up to the individual. I only build competition 4wds nowadays on the side due to me being Head machinist at a mining engineering company I didn't have the time to do smaller jobs as dealing with too many customers at once left me with very little family time & going to comps. I got the guys at Rocksliders to create some "cut out steps" in the top of my naked sliders. I wanted sliders that were upswept for clearance, but also needed steps to load kayaks onto the roof. I think I got the best of both worlds- cost a bit more than the standard naked versions- as the checkerplate steps had to be fully welded and then grinded for a smooth finish- but they did a real good job. 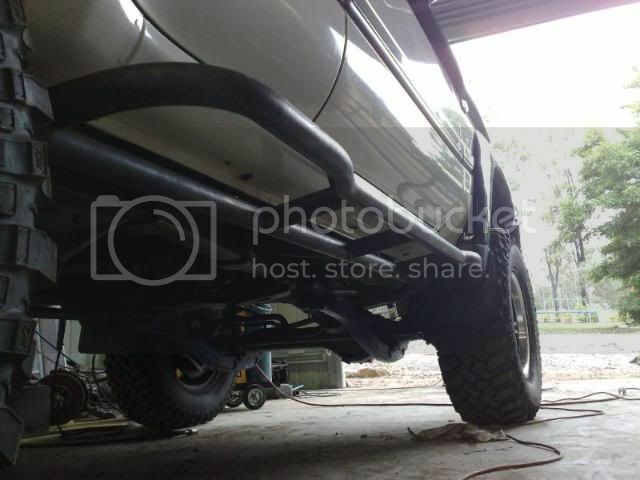 4wd26 wrote: I got the guys at Rocksliders to create some "cut out steps" in the top of my naked sliders. Notching steps in like that would compromise the strength. If you come down on a rock or log hard enough, they will bend up and dent the body very badly! 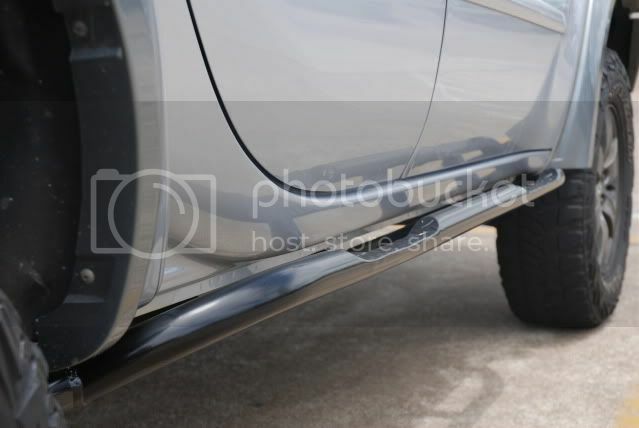 I want naked sliders too, and thought about the step aspect and decided I'll put some protective clear tape over the paintwork and black tread tape where the feet a re placed sideways to climb in. For you though, instead of notching out like that, a removable 4mm checker plate step bent to fit over the top bar and hook under the bottom bar would have been better imo. It's nice to have that up-swept clearance I agree. As for infills with the naked bar, some 3 ply reinforced rubber, brass eyelets and zip ties would help deflect stones and branches that want to flick up. That's how I'm going with it anyway. The step I suggested will come later. I might just put it to the OP company as an optional extra removable step for top loading like you need 4wd26. I have seen those designs in your pics somewhere before Brooksy, the infills set them off. But for real rocksliders, there is too much to get hung up on with low hanging bars. As you said, it's personal preference. In a comp or some tight places, you would have to agree Brooksy. Thanks for posting back on that and giving pics. Nice work! Yeah Brooksy, it's a shame you can't build me a set or could you subbie out your great design. 58bernie wrote: Yeah Brooksy, it's a shame you can't build me a set or could you subbie out your great design. Not really viable sorry as I have so many different designs & applications. The other main thing is everything I do is based on DOM/HREW imperial race spec tube & set CLR dies. No worries but it's my shout at the Pub Lane Tavern if you change your mind about doing a set for me. or can you give me your advise on some that makes a stronger step set to suit an 80 series than some off the shelf design, local or at least this side of the river.